Do you have any of this stuff lying around? 1. This is obvious; I don't know why it didn't occur to me before. 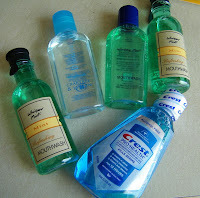 Use an alcohol-based mouthwash in the same manner I've been using hotel shampoos: To clean toilets! Pour mouthwash into the toilet, let it sit for 30 minutes, then swish with a toilet brush and flush. 2. Wash your toothbrush with mouthwash to keep germs at bay. 3. Use mouthwash as a minty glass cleaner. You can even use it to clean computer screens by dabbing some on a soft cloth. WARNING! This is just for GLASS computer screens, NOT LCD screens! I also came across the suggestion that a certain ratio of water and mouthwash is effective as an anti-fungus treatment for plants and for feet. I'll let you google that one though. I have another use- antiseptic mouthwash does a FANTASTIC job of healing canker sores in your mouth. I keep some on hand just for that purpose. I use it like regular mouthwash if I get one. The kids don't like the taste, though, so we dab the sore with a Q-tip dipped in mouthwash. Either way works great and the sore is gone in a day or two.